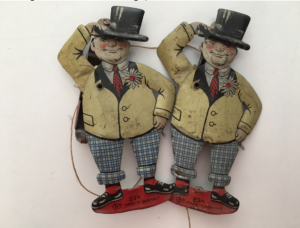 One of the earliest incarnations of the business was as a vintage toy shop, – there’s still a broken animatronic cat with a dying meow in the basement, which if recall my father said was part of a large collection previously belonging to an Indian Sultan. There was also a desk discovered beneath 45 years of piling up stock onto. It was like peeling away the years until I reached July 1967; there was a note inside the desk informing my father that he was a fool for moving from Ladbroke Grove to Cecil Court and that the business would never last… Sandwiched behind the desk and the wall were two tin figures I recognised as identical to the one used by Peter Blake for his installation The Toy Shop (1962 : the year my dad started trading on Camden Passage). The figures were situated across a paving stone chess board in the garden, recreating a scene from Alice Through the Looking Glass. This was in fact as Jann’s The Alice Garden, a seemingly now “lost” piece of work from their Ruralist period. My parents’ record collection was useless plunder for a child with nothing but Dixieland Jazz and show tunes…however there was a copy of Sgt. Peppers’. On the surface, it looked suspect: young men dressed in old fashioned costumes surrounded by a cast of thousands. More ye olde time music hall ? The record begins with an orchestra tuning up – it didn’t sound promising – then the singers going to sing a song??! I thought this was supposed to be ground breaking new music? However the combination of nostalgic swirling pipe organs, traditional Indian music, married with pop psychedelia… all fused into a body of work that revolutionised the appreciation of Western mainstream youth culture. The Beatles were forced to relocate to London, since that’s where the conceited record industry resided. The London entertainment elite marginalised their unparalleled success as Northern upstarts experiencing “flash in the pan success”, while the mainstream press constantly nagged how long their fame would last. Amazingly they blew off the London entertainment snobs and conquered the world by touring. Inevitably they paid a price as touring robbed them off their youths and talent as musicians; as the old adage goes, many people saw the Beatles, not many actually heard them above the screaming crowds. Their retirement from touring coincided with the advent of so called ‘Swinging London’ and the start of mainstream psychedelia. The resentment towards touring, possibly enhanced by a psychedelically informed regression, made them focus on their upbringing in Liverpool. This was one of the many abandoned threads leading up to the final album, that began with the double A-side single Strawberry Fields / Penny Lane, both focusing on locations from their childhood. This single could be seen as the first stage of recapturing who they were, a theme they returned to for the doomed ‘Get Back/Let It Be’ album. The Pepper concept, to perform as another entirely different band, was a ingenious way to fulfill their natural fate as entertainers, yet forge forward musically and creatively. In retrospect it seems strange that their far more psychedelic predecessor, ‘Revolver’ didn’t attract the same amount of media attention at the time, if only for the mind blowing track Tomorrow Never Knows and the genius of all of George’s contributions. However the opening to Sgt Pepper is a recording of musicians tuning up to give a live performance. You can understand the logic: send the LP out on tour instead of them. It was also a way of forcing their audience to really listen to their music. Peter Blake and his wife Jann Haworth’s studio in the early 1970s resembled Pleasures of Past Times. Amongst the piles of clutter waiting to be transformed into art, I recognised a pile of heads – the cut outs from the Sgt Pepper cover. Jann’s soft sculpture – a knitted old lady, knitting – sat ominously in wicker chair. This had also adorned the LP sleeve, somewhat obscured by another of her sculptures of Shirley Temple on its lap. As I ascended a spiral staircase to a balcony, I was confronted by the Sonny Liston waxwork, that stood on the opposite side of the cover, almost as if he was monitoring my unsupervised wandering…. In the 1960s Peter Blake and Jann Haworth were both represented by the Robert Fraser Gallery on 69 Duke Street (opposite Selfridges). This was the hippest gallery in town attracting an international elite of artists, film makers and pop stars: The Beatles, Dennis Hopper, Kenneth Anger and The Rolling Stones etc… While Robert Fraser remains an extremely interesting character, integral to the evolution of pop culture in the capital, he never gets enough kudos beyond cursory references in Beatles biographies (for Sgt Pepper) and Rolling Stones books for his involvement in the 1967 drug bust. I’ll be dedicating a future blog to him. For further reading Groovy Bob: the life and times of Robert Fraser (Faber HB 1999. Out of print but in stock here at POPT). Amongst the paintings of strippers, wrestlers and pin-ups was an unfinished portrait of the mop top Beatles. 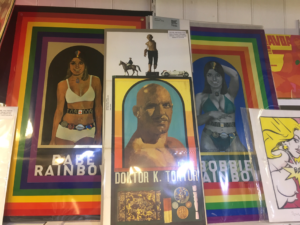 We have copy of the show’s catalogue in stock as well as a couple of rare posters (please email -including one signed by Blake date 1965) depicting the fictional wrestler Doktor K Tortur on the cover. He was supposed to be the father of another female wrestler Babe Rainbow. In 1967, Blake commissioned Dodo designs, a company that produced fake Victorian tins for shops such as I Was Lord Kitchener’s Valet, to print a limited edition print of her on tin. Lord Kitchener’s Valet was a small chain of shop’s situated in Piccadilly, Carnaby Street and the King’s Road. 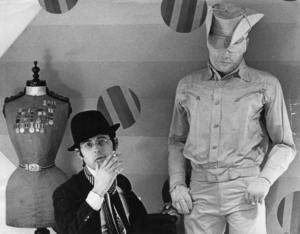 They helped instigate the sixties pop ‘Victoriana’ revival by selling old military uniforms to the likes of Jimi Hendrix… Their stock of uniforms are believed to have also inspired the Sgt. Pepper uniforms. Instead of using old uniforms, The Beatles had costumes made from ultra-violet (black lite) satin bought from Borovicks on Berwick Street (who supplied “exotic” fabrics to the London shows) and tailored by film costumiers Berman’s.. With Babe Rainbow, Blake liked the idea of the cheap affordable multiple: art for the masses, the same validation he applied for designing the Sgt. Pepper sleeve. Although Babe Rainbow initially sold for £1.00 GBP in January 1968, they were soon retailing for £20.00 GBP! 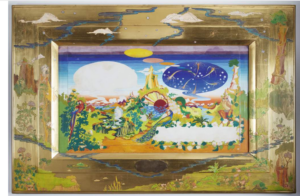 50 years later, an unscratched, unbent copy sells for several hundred, if not more… Forty years later, he revisited the family of wrestlers to produce a granddaughter, Bobbie Rainbow for the Pallant Gallery. (We have a signed artist’s proof in stock as well as a clean Babe Rainbow. Before Fraser intervened, The Beatles had already commissioned the Dutch collective, The Fool to produce artwork for Sgt. Pepper. This might not have progressed any further than what Fraser described as a “psychedelic Disneyland” for the inside gatefold sleeve and the red and white striped inner sleeve (which was used). McCartney trusted Fraser’s taste implicitly after he acquired several Rene Magritte paintings on his behalf (incidentally, one was used as a prop in the film Performance starring Mick Jagger). The Fool’s original artworks was auctioned by Sotheby’s 10th December 2018 with an estimate of £60,00-£90,000. This was not the last time Fraser would orchestrate The Beatles creative direction. In 1968 he visited McCartney and left a small painting by Magritte of an Apple on the table. Another of his artist’s, Richard Hamilton designed the cover for the Beatles first LP on their new Apple Record Label: the antithesis to Sgt. 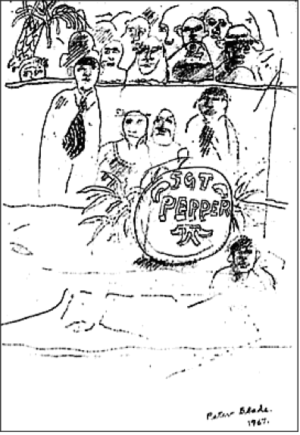 Pepper… the conceptual White Album. However Fraser was a contentious character, to say the least. Although the Pepper sleeve assured Blake’s status as a national treasure, there was always the latent gripe that Fraser paid himself £1,000 GBP, while Peter and Jann got £200 GBP for their involvement (comparatively, the florists were paid £250.00 – and didn’t even deliver as Jann required). Fraser also commissioned his in-house photographer, Michael Cooper to shoot the cover photo. Cooper, presumably at Fraser’s instigation, also shot The Stones’ psychedelic offering Their Satanic Majesties Request, another studio built set in the same vein as Pepper. Cooper was instructed to “out do” his Pepper sleeve, but even with the lenticular sleeve it just looked like a copy. The story behind the cover creation is that Paul McCartney provided Peter Blake with sketches of his concept for the Beatles playing the role of another band. 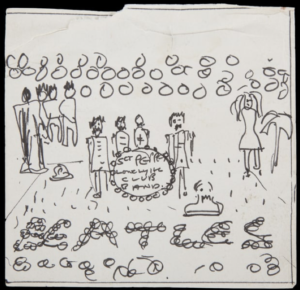 Until recently, the earliest known prep drawing to have survived was one by Peter Blake – that was until a sketch book of John Lennon’s was discovered at his former home Kenwood, in Surrey. Inside there’s a drawing that clearly depicts the sleeve layout – more clearly than Blake’s. However Lennon, an ex-art student, who attended more than one meeting with Blake could easily have sketched out the visualisation for his own benefit. The drawing was auctioned as Lot 81 in Julien’s Auctions’ Music Icons sale on 20th May in New York City …. The starting bid was $10,000 USD, and sold for $87,500 … however don’t forget to add that annoying 25% buyer’s premium on the final hammer price! Another possible inspiration for the cover design was recently highlighted by Jorgen Johansson. Students at the Stockholm School of Economics had a comedic orchestra called Mercblecket. 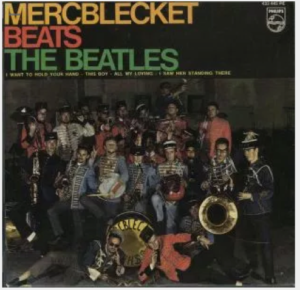 They made an EP of Beatles cover tunes in 1964 called Mercblecket Beats the Beatles. The orchestra included foreign student Roger Wallis from Rugby, who managed to hand McCartney a copy of the EP when the Beatles toured Sweden in July 1964. Sgt. 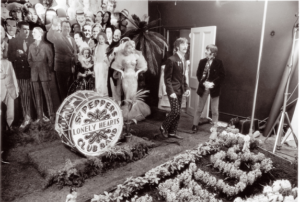 Pepper’s Lonely Hearts Club Band was officially released on June 1st, 1967, although it was rush released in the UK on 26th May, the date observed for the 50th Anniversary reissue. It was previewed on radio in the UK on the BBC’s Where It’s At, the week before on 20th May, except for A Day In The Life, which had already been banned by the BBC the day earlier, as it was cited to be a drug influence song.